The Automatic Shotgun and its associated HUD icon. The AA-12 in real life. The Automatic Shotgun (AA12) is an assault shotgun featured in The Ballad of Gay Tony. Based on the AA-12, the Automatic Shotgun is available in two forms: its more conventional form functions like a regular shotgun that fires buckshot, while the second, more devastating form, known as the Explosive Shotgun, is capable of firing "Frag-12" explosive rounds that can inflict heavy damage on vehicles and can kill an enemy in one shot up close or strike an enemy down from a distance. It takes two to three explosive rounds to ignite the fuel tank on a normal vehicle while five to six rounds are required to takedown an Annihilator at low altitude. The regular Automatic Shotgun is a separate weapon from the Explosive Shotgun; this means that in order to switch ammunition, the player must discard their Automatic/Explosive Shotgun and lose their ammunition reserve. Regular Automatic Shotguns are distinguished by its red casing in the loading chamber, while Explosive Shotguns feature green casings. Differences should also be noted in their ammunition capacities, while both variants are capable of holding 20 standard or explosive shells per magazine, the Automatic Shotgun can only hold 230 regular shells in reserve, while the explosive variant can hold up to 580 rounds in reserve. In terms of rate-of-fire, both variants fare identically, although both variants do not fire fully automatic like its real world counterpart, or the Assault Shotgun. Rather, they behave like a semi-automatic in a similar fashion to the Combat Shotgun in GTA IV. Strangely, if the player fires the Explosive Shotgun while falling or being burned, it fires much faster, comparable to the Assault Shotgun. However, the Automatic Shotgun (standard shell variant) fires much slower than normal. 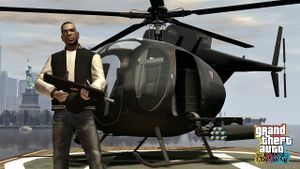 Luis wielding an Automatic Shotgun aside a Buzzard. The beta version of the Automatic Shotgun fired in full-automatic mode. The gun was more likely given a semi-automatic firing mode due to its real world counterpart. The real AA-12 fires at over 300 rpms, nearly half to that of an AK-47, making this an extremely dangerous shotgun. With the real world accuracy, combined with Frag 12 shells, one could completely rip up opposition in both the single player & multi-player modes. Despite that both variants have 20 shell capacity, picking up a Explosive Shotgun will have only 10 rounds loaded and no reserve ammo. The ejection port is on the wrong side in the HUD icon. Armando Torres gives the player a regular version in "Corner Kids". The Explosive Variant is received from Yusuf Amir in the mission "High Dive". After "High Dive", the player can purchase explosive shells from Armando. Both variants of the Automatic Shotgun are also available in Multiplayer. Explosive variant spawns in Safehouse after completing 30 Drug Wars and High Dive. This page was last modified on 1 October 2012, at 14:02.